We offer 24 hour emergency service for furnace repair. No matter the time of day, one of our trained service techs is available to come to your home and help to resolve any HVAC issue you may be experiencing. Advantage of Choosing Schultheis Bros.
Our Reputation: Schultheis Bros. is one of the oldest heating and cooling companies in the Pittsburgh area. We have been providing our services for over 70 years and we have an A+ rating with the Better Business Bureau. 24 Hour Repair Service: No matter the day or time, a trusted service technician will be able to come out to your home. 24 Hour Live Customer Service: At Schultheis Bros. you will never get an answering machine when you call. We’re committed to gaining customer satisfaction by always having a live customer service rep 24/7. 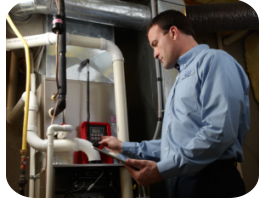 Service All Makes and Models: Due to the advanced training our service technicians receive, they are able to repair your furnace regardless of Make and Model.